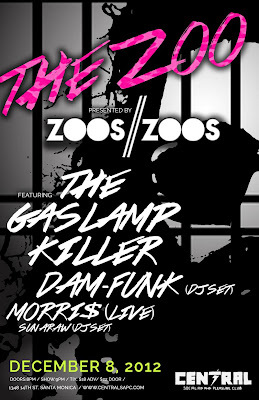 Zoos Zoos Launch with Dam Funk & Gaslamp Killer! The turn up gets real this Saturday at The Central SAPC as newly minted company ZOOS//ZOOS hosts their first event. Pulling out a handful of stops- Zoos Zoos recruited LA’s own Gaslamp Killer and Dam Funk to headline a night of dope soundscapes that also includes Morri$ and Sun Araw. Prepare to have your face melted with ill switches, beat blends and a healthy dosage of the finest in Los Angeles’ beat culture. Cop your tickets here – and one lucky individual that mentions @supergoodmusic @thecentralsapc @damfunk @gaslampkiller in a tweet or emails contest@supergoodmusic.com is going to win a pair…so try your hand at that too.